The Office of Faculty Governance, on behalf of the Committee on Honorary Degrees and Special Awards, is now accepting nominations for the University’s 2019 Distinguished Alumna and Alumnus Awards. 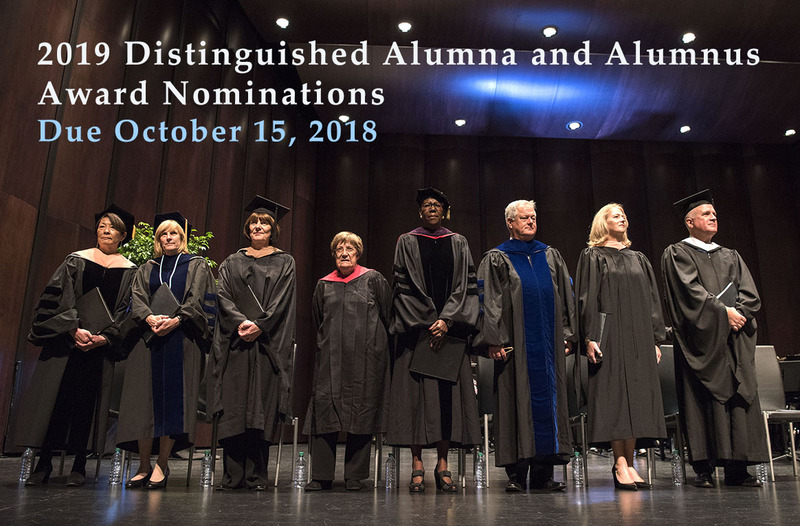 Nominees for these awards are selected by the faculty’s elected Committee on Honorary Degrees and Special Awards, and they will be presented at the October 12, 2019, University Day ceremony. These awards recognize UNC-Chapel Hill alumni who have made outstanding contributions to humanity in any walk of life. Nominees must be alumni of the University of North Carolina at Chapel Hill. This includes all persons who were registered for at least one full academic year as a student in residence in any college or school of the University. In general, anyone listed in the General Alumni Association’s Alumni Directory is eligible except members of the UNC-Chapel Hill faculty, staff and administration. They become eligible two years after separation from the University.